Get the natural advantage of Bio-Active Rooibos extract and plant-based anti-ageing complexes to protect your skin against environmental and lifestyle stress, and be your best age ever. Introducing African Extracts Advantage. Antioxidant- rich Bio-Active Rooibos extract made form green, unfermented Rooibos leaves. Anti-Ageing complexes with plant extract proven to protect the skin from environmental pollutants- ginseng, apple, peach, wheat and barley, lady’s thistle, sea fennel, horse chestnut, buckwheat seed, soy, lavender and green tea. These plant extracts boost moisture, tighten, firm, reduce puffiness and strengthen cell structures. Antioxidant vitamin A , C and E.
Hyaluronic acid, ceramides, allontoin and light deflectors. High levels of vitamin E, a natural skin-conditioning agent and antioxidant, are included to enhance the efficacy of active sunscreen ingredients, reducing the formation of free radicals from exposure to UV rays, promoting the healing process, strengthening the skin’s barrier function, protecting the skin barrier’s lipid balance, and reducing trans-epidermal water loss. Vitamin C works as a powerful antioxidant and whitening agent, with both anti-acne and anti-aging capabilities. The range is available from leading retailers. Find out more at www.africanextracts.com. 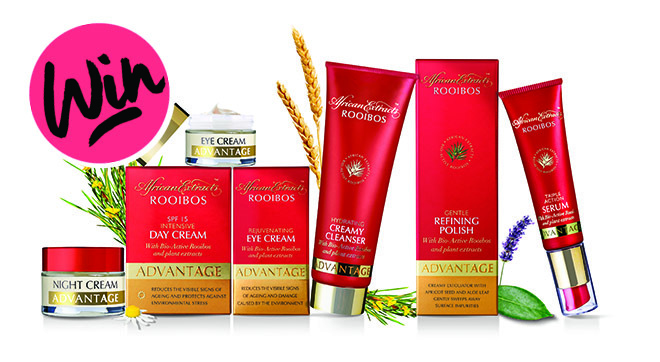 One lucky reader will win an African Extracts Advantage hamper worth R500! Enter and submit your details below. This competition is open to SA residents only and closes at 21:00 on 8 April 2019. Only one entry per participant will be taken into account for the prize draw. The winners will be drawn from all the correct entrants and notified via email. This prize cannot be exchanged for cash. BeautySouthAfrica.com’s decision is final and no correspondence will be entered into. We will not share your information with any third parties. If winners do not respond to email notification within three days, another winner will be drawn. BeautySouthAfrica.com will supply all hampers to the delivery company in good order, but will not be held liable for the condition of hampers arriving at the winners’ chosen delivery address. Please allow six to eight weeks for delivery. If you have won a prize on BeautySouthAfrica.com in the last two months, you are ineligible to win this competition.